Each time you take a photo with FISHBUOY Mobile, you add to your portfolio of fish catches. 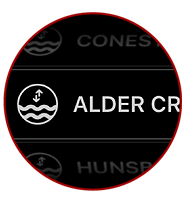 With a few simple clicks you can pull up your fish catch locations, date and time, water conditions, weather conditions, species of fish, and much more! How many times have you been out with your fishing friends, anxiously planning your next trip together? Inevitably, you begin to refer to your past fishing trips and 9 times out of 10, you argue about the location, conditions and of course, size and quantity of fish. 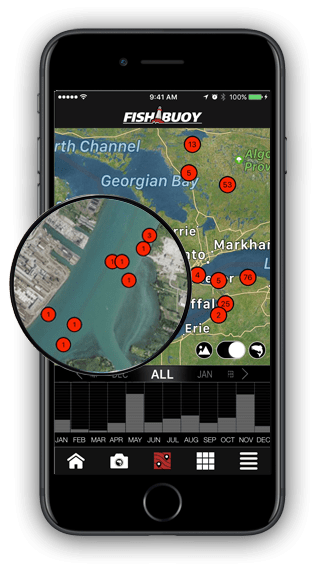 As a map-centric application, FISHBUOY Mobile helps you to quickly access those historical fish catches and provides measurable information - no more need for guessing. Your catches are plotted on a map helping you to conduct indepth analysis of your fishing success - using spatial and temporal techniques. 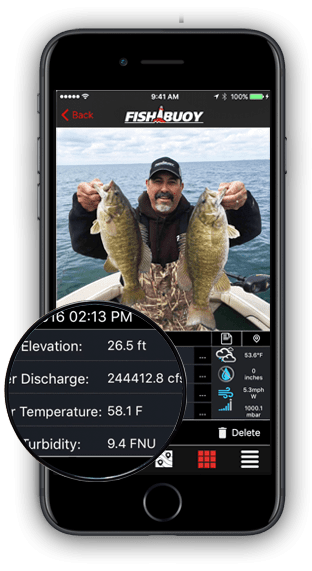 A big advantage with FISHBUOY Mobile is that you can combine public photos posted by others, with your photos, to get a statistically sense of where the best locations are to fish. While on the water or hiking across lands, FISHBUOY Mobile offers real-time tracking of your current location relative to your fishing spots. Like a navigation system, FISHBUOY Mobile will help you get to your fishing hole. It's important to know where you are fishing. It's even more important to understand the physical water conditions that influence fish activity. FISHBUOY monitors thousands of water bodies across North America in real-time. Data such as water temperature, water clarity (turbidity), water levels, water discharge, etc.) can be visualized via FISHBUOY TripPlanner. 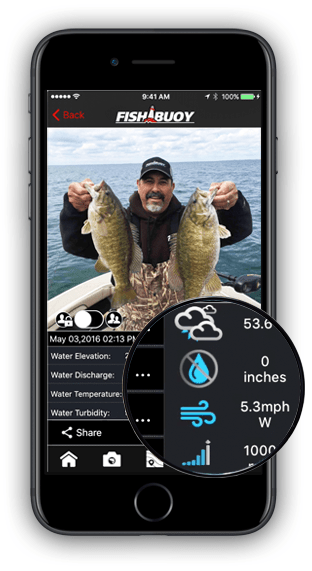 FISHBUOY Mobile automatically captures water data, weather data, geopgraphic position and stores the data with each photo for future reference. Taking a photo and plotting it on a map can be an extremely powerful tool for identifying where you have caught fish in the past. Even more powerful is the ability to filter photos based on time and location. 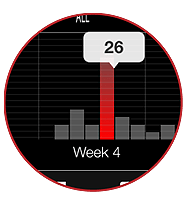 FISHBUOY Mobile Timeline Photo Filter (TPF) allows you to view all private and public photos on a map, and filter them by month, week and day. This feature provides deep insight into where fish are being caught throughout the year and by location. 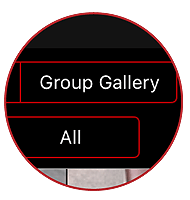 This can be conducted on your own private photos, photos shared by group members, and photos shared publicly. Depending on which camp you sit in, you either want to keep your photos private - or - you want to share your success with others. 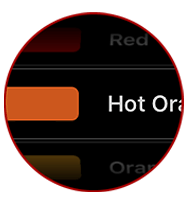 Everyone has their preference and FISHBUOY offers solutions for both. 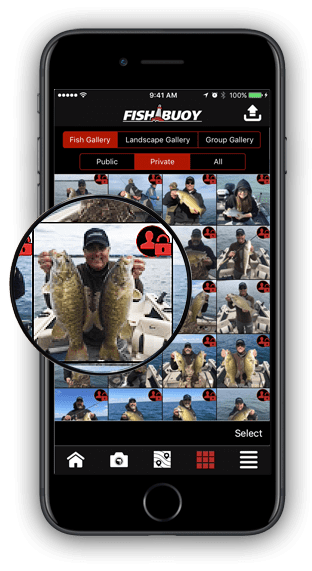 When you take a photo, you have the option to keep your fish catch information private and only share it with people you want. 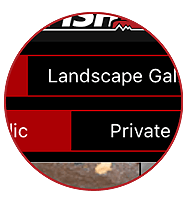 Simply slide the photo setting to "Private" and store it in your own private photo gallery. If you change your mind, you can switch to public anytime in the future! Want to help out your fellow fishermen? Share your fish catch for bragging rights? FISHBUOY offers you the ability to share your photos publicly. 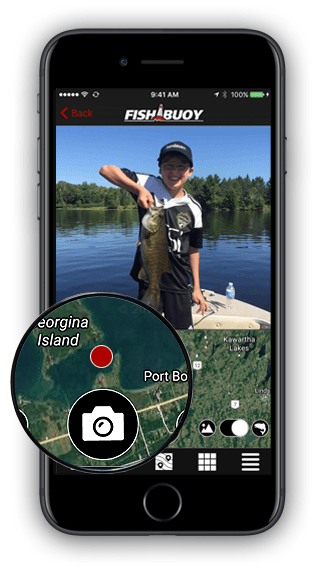 Simply slide the photo setting to "Public" and post your fish catch to the world. If you change your mind, you can switch back to "Private". Looking for a specific species of fish? FISHBUOY TripPlanner offers a database of many popular freshwater sports fish. Working with fisheries agency across North America, FISHBUOY is compiling one of the most complete freshwater sports fishing inventories across North America. Once you have identified your target species, FISHBUOY will help you find where they live and when to fish for them using biologic indicators such as pre- and post-spawning periods. 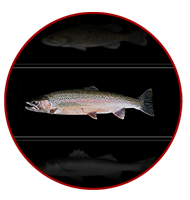 Our database is comprised of millions of known fish population found in freshwater lakes, reservoirs, rivers, streams, and creeks, both resident or stocked, across North America. As you build your portfolio of fish catches, you want to capture the history of your best bait colors. Sure, there are literally thousands of colors and color combinations of lures and bait types. The bottomline is, each time to take a picture in the field, it is important to understand what triggered that hit. The majority of species are visual feeders and color becomes a significant factor. FISHBUOY allows you to enter the dominant bait color used and tags it to the photo for future reference. Now you know what works, based on your style and fish targets. You catch a fish - the very next thing you do is look at how big it is. Everyone has different ideas about weight when they don't have a scale with them, and that's okay. 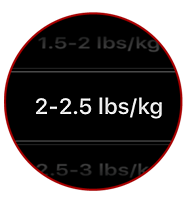 FISHBUOY offers the ability for you to tag your approximate fish weight to each photo, with a simple selection so you can release your catch for another day.